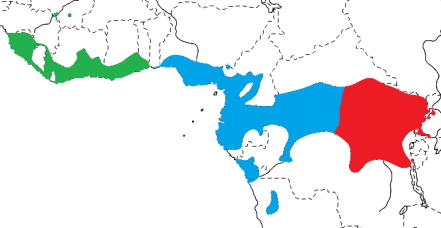 The Crested Malimbe Malimbus malimbicus is a common and distinctive malimbe in West Africa. 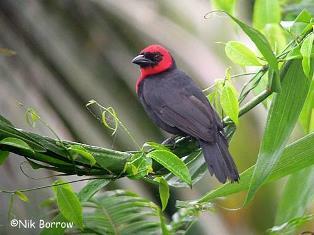 It is the only malimbe with a crest and with a mainly red face and small black face. The female is similar to the male but has a shorter crest. The juvenile is sooty brown above, grey-brown below, and the red is replaced by brownish orange. The Crested Malimbe inhabits primary and secondary lowland forest, forest disturbed by logging, and also swamp forest, gallery forest and coffee forest. It is usually found near palms. The Crested Malimbe keeps mainly to the middle strata, searching in foliage and on thin twigs, keeping mostly to the inner parts of the understorey canopy and in dense clusters of lianas. It sometimes visits clearings and road edges. The Crested Malimbe usually occurs singly or in pairs, rarely in small flocks, and it sometimes joins mixed-species foraging flocks. It roosts in its nests at night, and by day is usually found near its nests throughout the year. The Crested Malimbe feeds mainly on insects, including beetles, grasshoppers (up to c. 70 mm long), insect eggs, cicadas, caterpillars. 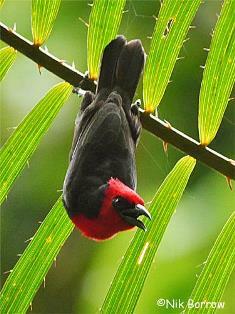 It also feeds on oil-palm fruit fibres and spiders. The Crested Malimbe is a monogamous, solitary nester. The nest is a compact, globular mass of woven thin strips torn from fronds and stems of palms. the nest strips are short, dry and spiky and stick out at all angles from the nest. The entrance is below, with a very short and ragged entrance tube. The inside of the nest remains dry even during heavy rain. Nests are often in climbing palms, fixed at the tip of the palm frond. A pair may build 3 nests at the same time. 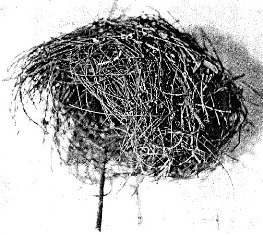 Many nests are abandoned, or used only for roosting. The male chooses a nest site and starts building by making a ring of leaf strips that are firmly attached below a palm midrib. The female follows the male, and then helps build from the ring stage. A nest can be completed in a single day. At one nest a male made 80 trips and the female 35 visits in 4 hours, bringing material every time. There are no PHOWN records for the Crested Malimbe (see PHOWN summary), and many are needed of this species. Submit any weaver nest records to PHOWN (PHOtos of Weaver Nests) via the Virtual Museum upload site.